When Gerard Blitz launched Club Med in 1950, he did so with the mission of encouraging passengers to appreciate the great outdoors while enjoying sports and physical education. Today, the company's website touts that "wellness and conviviality are our watchwords." The onboard vibe is decided European with most passengers, many of them French or at least French-speakers, hailing from the continent. One of the world's largest sailing ships, Club Med 2 -- with a marina and Caribbean/Mediterranean itineraries -- draws fit European travelers who demand active adventures. Club Med 2 is a five-masted staysail schooner; it's a fleetmate to Windstar's Wind Surf (which formerly sailed as Club Med I). The ship accommodates 368 passengers and was unique at the time of its 1996 launch because of its expansive 26,000-square-foot footprint. Indeed, it's still one of the largest passenger sailing ships in the world. The crew (200 members strong) as well as the passengers are mostly European with French as a first or second language. Most passengers are onboard to soak up the sun, visit sunny destinations (the Caribbean in the winter and the Mediterranean during the summer) and take part in active adventures like kayaking or windsurfing from the yacht's aft marina or enjoying the onboard fitness center that offers a range of classes, including cardio training, Aquadynamic and Pilates. The ship offers a windsurfing school (small-group lessons) as well as instruction on sailing various types of watercraft. You can also refine your water skiing and wakeboarding skills during the cruise through group training. The all-inclusive fare includes meals, an open bar, all- day snacks and daily teatime. There are two restaurants. The main dining room offers a buffet at breakfast and lunch, but serves dinner a la carte; a specialty restaurant is free of charge. Suite passengers can order room service any time, while lower cabin categories are restricted to Continental breakfast delivery only. There are also four bars onboard. The spa is run by Carita and offers a range of massage and beauty treatments. At night, there's a piano bar and karaoke. Children must be 8 years or older to travel aboard Club Med 2. There is no kids club or programs for children or teens. Passengers should be fit to sail aboard Club Med 2; there is a 40-foot gangway for embarking and disembarking the ship. Europeans, including plenty of French-speakers, fill the cabins aboard Club Med 2. Some Canadians book passage as well. It's rare to find an American onboard. 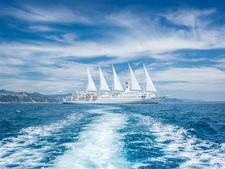 Most Club Med cruisers prefer an active lifestyle and partake in the many physical activities the ship offers.